The forest glades were also used for boat-building, and some spots far from the sea are still known locally as 'the Boatyard' — presumably to the puzzlement of visitors. Burley lies 4m SE of Ringwood at SU2103 (map 195). The Warne family mentioned below is commemorated in Warnes Lane at Burley, and in the Warnes Bar at the local Queen's Head Inn — secret cellars were discovered at the pub during building work. 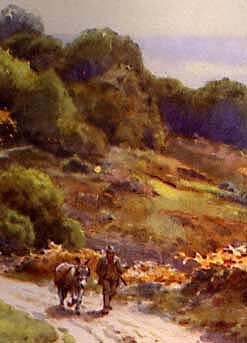 The most remarkable sight, though, is the Smugglers' Road, which can be reached from the car park of the same name at SU188040 Here, sunken roads criss-cross the heath land — reputedly constructed so that smugglers could move contraband unobserved. Crow-Hill Top and Knaves Ash are close-by at SU182038 Vereley Hill where Lovey Warne wore her red cloak as a warning signal is at SU1904 Ridley Wood, at SU2006 was a smugglers' market-place. Places all over the New Forest are traditionally strongly connected with the free-trade, but none moreso than the Burley area. This was the home of the Warne family, John, Peter, and the strangely-named Lovey, their sister. They lived at Crow-Hill Top, in a house called Knaves Ash, just outside Burley. The most picturesque yarns are associated with Lovey Warne: legend has it that when the revenue men were abroad in the forest, she would parade across Vereley Hill wearing a red cloak, as a warning to smugglers on the coast to avoid the area. At night smugglers living at a cottage on the hill would hoist a lantern up a nearby oak tree to give the warning signal. Lovey Warne's role in smuggling didn't stop at signalling. According to legend, she would visit ships in Christchurch harbour, undress in the privacy of the captain's cabin, and wind herself with valuable silks before getting back into her clothes — somewhat fatter. Evidently the sudden gain in weight passed unnoticed, since Lovey would walk straight past the revenue men without arousing suspicion, and return home to be unwound and relieved of her burden. This clever ruse apparently had to stop when one of the revenue men invited Lovey for a glass at the Eight Bells in Christchurch. Emboldened by drink, he became amorous and started to explore Lovey's fine thighs with his hand. A swift jab in the eye deterred his amorous advances, but Lovey was retired to the smuggling equivalent of a desk job on Vereley Hill. This town, which was once called Forde, was a notorious smuggling centre, and a local saying runs 'Keystone under the hearth, Keystone under the horse's belly' since these were two favourite places for hiding contraband — under the stable floor, and under the hearth, with a fire burning innocently on top. When opposition at Fordingbridge got really intense, smugglers would sink tubs in the river Avon. A favoured route for contraband from the town ran via Redbrook, Stuckton and Frogham, and it's significant that when the Hawkhurst gang rescued a cargo of contraband from Poole custom house, their convoy came through Fordingbridge, where the population turned out to watch and cheer. SU0513 8m NW of Ringwood (map 195). The exciseman's house is on the corner of the street opposite the present post office. Being made sure of their prize the ruffians soon followed, and one of them beat in the door with the sledge hammer, whilst another stood in the street with a loaded horse pistol, threatening to blow out the Exciseman's brains, or of any other person who offered to resist them. Having secured the 'goods' they soon loaded their carts and horses, and with one outrider in front, armed, and another in the rear they galloped away with them; nor had the incident any unpleasant sequel so far as I ever heard, and it only afforded a subject of gossip in the Public-houses of Cranborne. A search of the parish registers suggests that the Dan mentioned in this quote was probably Daniel Sims, who died in 1826 from injuries caused by a fall from his horse. For obvious reasons, smuggling stories are most abundant on the coast, but in a few instances the yarns penetrate very much further inland. The story of the Wiltshire moonrakers is a case in point. According to legend, smugglers who lived in the village feigned stupidity to conceal their activities, and put it about that they spread manure around the church tower to make it grow taller. They also told strangers that every inhabitant of the village had once walked to Devizes to watch an eclipse of the moon. But the most celebrated story tells how several villagers were caught one night in the act of raking the village pond to haul out tubs that had been sunken in the brackish water. The excismen who demanded to know what was going on were told by the smugglers, who pointed at the moon's reflection in the water, that they were raking the pond to recover the 'big yellow cheese' that was floating in it. The battle of Mudeford took place on what is now a car-park at Mudeford Quay (SZ1891) Nearby is Haven Point and Haven House, where the body of George Coombes, who was convicted of murder after the battle, hung in chains on a gibbet. The Haven House is alongside the Run at the harbour entrance. Mother Siller's Channel lies between Grimsbury Marsh and Pound Hill, and is crossed by a bridge at SZ168918 Also see Smugglers' Ditch on the west side of the harbour at SZ165919 The 8 Bells is now a gift shop, but you can still drink in the Ship in Distress at Stanpit (map 195). This assessment seems to be born out by the wealth of evidence linking Christchurch to the free-trade. Numerous writings refer to the smugglers; there is a flourishing anecdotal tradition on the subject locally, and the official records tell a similar story. In the town itself there are still surviving many buildings that harboured smugglers or contraband — and usually both. 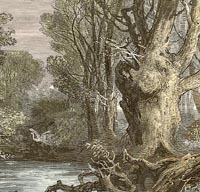 Christchurch had a number of natural advantages for smugglers. The only land approaches to the town were across two bridges, and one of these was frequently out of use. The other could easily be blocked — perhaps by a herd of sheep — when there was a sign of danger, giving the smugglers time for a leisurely escape. Another plus was the conjunction of the Rivers Stour and Avon, which flow into Christchurch harbour: these were major arteries for contraband, at a time when transport by water was very much faster and cheaper than overland movement of goods. Finally, there was the harbour itself. At the seaward end the sole entrance to the harbour is a narrow channel, the Run, which was negotiable only with extreme care. Sailing into the harbour was made doubly difficult by sandbanks that could shift overnight. To the smugglers, most of whom were superb seamen (and who could in any case afford to lose a vessel or two) the harbour entrance was an open gate. But to the less skilled sailors on the revenue cutters, the Run acted as a barrier that they feared to pass. Mother Siller's Channel is today barely a creek cutting through the Stanpit marshes, though two centuries of silting have probably greatly reduced its width. The channel led to a pub called The Ship in Distress, and it was the landlady of the pub, Hannah Seller, who gave her name to the creek. Hannah had been married to the landlord of the Haven House at Mudeford, and on his death, she took over the inn, later moving to the Ship. It appears that Mrs Seller was deeply involved in the free-trade: she allowed both pubs to be used for storage, and would turn out her customers to assist smuggling vessels in trouble. When Hannah Seller was landlady of the Haven House her pub played a central role in a drama that rocked Christchurch in 1784, and that became known as the Battle of Mudeford. The story starts —with a run. Two smuggling luggers had shipped across from the Channel Islands a huge cargo tea and brandy, and on July 15th a crowd of some 300 people was busy unloading the luggers at Mudeford beach, just east of the Run. The goods were being loaded into about 50 carts, drawn by 300 horses, but things did not go according to plan. A navy sloop, HMS Orestes , rounded Hengistbury Head, with two escorting revenue cruisers. When the 'philistines' appeared on the scene, there was pandemonium. John Streeter, a Christchurch man who had crewed on one of the two luggers, rode to the Haven House , and herded the customers out of the pub and down to the beach. The luggers had by this time been beached on the shingle, and the patrons of the Haven House helped to strip the luggers of all their lines and rigging. Meanwhile, the cart loads of contraband were moving away from the shore. At sea, activity was just as frenetic. Seeing what was happening ashore, the captain of the Orestes resolved he would seize the cargo if possible, or failing that, destroy the luggers. The sloop-of-war and the escorts lowered six rowing boats filled with intrepid sailors armed to the teeth, and the boats closed in rapidly on the beach. As they neared the shore, Mr William Allen, the master of the Orestes shouted to the smugglers remaining on the decks of the ships to surrender. The reply was a deafening fusillade, and Allen fell back in the boat, mortally wounded. Still some 200 yards from the shore, the naval and revenue men returned fire. A running battle ensued, but it was hardly a fair fight: the smugglers were firing from trenches that they had dug along the beach, whereas the preventive forces had to take aim from rocking open boats, with no cover. When the boats landed, the smugglers retreated to the Haven House , and continued firing from there. The fighting continued for some three hours (some accounts say for 15 hours) during which the guns of the Orestes were trained on the Haven House. Somewhat inaccurately, it would seem: stray canon balls actually struck the Christchurch Priory two miles away . Eventually the revenue and navy men captured the two luggers and a number of small boats that the smugglers had scuttled in shallow water. The price of the seizure was high: while the preventive forces were pinned down on the beach, they suffered many casualties — quite apart from the death of one of their number. By contrast, the smugglers had secured their cargo, estimated (probably generously) at 120,000 gallons of spirits and 25 tons of tea, and had for the most part melted away into the surrounding countryside. It's not known whether any of them were injured. Hengistbury Head was a favourite landing point, and compared to Mudeford beach the Double Dykes there provided much more cover for the land party awaiting the arrival of a smuggling lugger . Those residents of Christchurch who were not directly involved in the free-trade provided help and support when called on; local people with special skills learned that if they helped out and kept their lips buttoned, they'd be rewarded in due course. A local surgeon, Dr Quartley, cited this example from his own experience: soon after setting up in the town he was woken by a loud rapping on the door in the middle of the night. On opening, he was greeted by a pair of horsemen, who told him his skills were needed urgently, and that he should saddle a horse and follow them. Cottages in Whitehall and Silver Street were also used as refuges, and for the storage of contraband. Strangely, the Priory itself seems to have been overlooked by the smugglers — unlike their contemporaries elsewhere in England. Hurn Court is at SZ122958 1m S of Bournemouth airport (map 195). All classes contributed to its support, the farmers lent their teams and labourers, and the gentry openly connived at the practise and dealt with the smugglers. The cargoes, chiefly of brandy, were usually concealed in furze bushes that extended from Ringwood to Poole, and in the New Forest for thirty miles. The concealed chamber would have made an admirable hiding place for Tregonwell's flunkeys to conceal smuggled goods, and the holiday home provided the ideal excuse for their master to visit the coast and supervise operations. ...set out with Mr Bacon to the West Coast on discoveries... In the Heath at Bourn we saw a fire lighted up, and immediately went to the spot, by the time we got there the fire was out, the smugglers flashing and striking up light with flint and steel all night in different parts of the heath and on the cliffs. Mr Williams...informed me that there had been a run of goods, about three or four hundred casks... Traced the smugglers into the country and at Hinton searched several suspected places. No success. E. Russell Oakley, in his book The Smugglers of Christchurch, explains that the lugger had probably being hovering of Hengistbury Head while the unhappy riding officer was patrolling near East Cliff. On seeing the flashes, fires and sparks, the ship would have landed the cargo between Highcliffe and Barton. To make an interception, the customs officers would have had to ride across the heath, following winding country lanes and crossing narrow bridges to Christchurch, via Iford, then to Somerford and on to the coast. The lighting of fires on the heath was probably a diversion to attract the officers to Boskum (Boscombe). Many places associated with Gulliver's story are still worth a visit: one of his farms is on the B3072 just north of West Moors at SU0703 At Kinson the tower of the church of St Andrew (SZ064964) was used for storing contraband, and grooves cut by smuggler's ropes could at one time be seen. Ledges on the tower have also been damaged by the hauling of kegs. The table tomb at the foot of the tower was supposedly purpose-made for the storage of contraband. 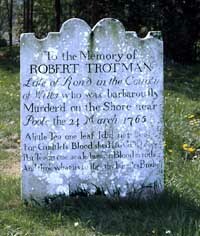 On the N side of the church is the grave of Robert Trotman, the head of a gang of smugglers shot by the customs men in 1765. Woodlands, the Dower House, Ensbury vicarage and Kinson House are also said to have had smuggling connections. At Wimborne Minster (SU0001) Gulliver's House is in West Borough, and his tomb stone can be seen in the Minster, on the north wall of the baptistry (map 195 -- thanks to Christine Oliver, the head guide, for this info). Bournemouth's most famous smuggler was Isaac Gulliver, who achieved almost legendary status. Though his reputation as a lovable villain is dubious, in one respect at least, Gulliver is different from other partners in the free-trade: he claimed never to have killed a man in the course of a long career. Unlike some smuggling heroes, such as Sam Hookey, who was created in the 1950s to advertise a holiday camp, it is clear that Gulliver really did exist, and carried out some extraordinary exploits. While on the one hand there is ample documentary evidence surrounding his life, on the other it's certain that many of the tales about Gulliver have been embroidered to a greater or lesser extent. So in the account that follows, I've tried to differentiate between the facts and the legends. Though Gulliver spent much of his life in Dorset and Hampshire, he wasn't born in either of these counties. His family were from Wiltshire, and Isaac was born in Semington, near Melksham, on September 5th 1745. We know little about his youth, though one Isaac Gulliver does occur in the custom house records 1757: in March, four customs officers found a cargo of spirits and tea at the foot of Canford Cliffs Chine in Bournemouth (it was then called Bitman's Chine). The contraband was guarded by a handful of smugglers, and three of the revenue men seized the goods while their colleague went for a cart to transport the cargo. Before he returned, the smugglers were reinforced, rescued the cargo and beat off the customs officers. An informant later alleged that 'Isaac Gulliver, very often at ... the New Inn within the Parish of Downton' was one of those responsible. Our Isaac Gulliver was then only 12, so it seems likely that the man accused (he was never convicted) was the boy's father. As he grew older, young Gulliver developed attributes that were to stand him in good stead in his smuggling enterprises: he was described as strong in physique and with great determination of character. In adulthood, he was credited with a genius at speculation, and certainly, he grew to be a very wealthy man. This stretch of coast, in fact, was Gulliver's favourite landing place: he used Branksome Chine, Canford Cliffs, and Bourne Heath. While he developed his smuggling skills, Gulliver had to have an alibi. His ostensible profession was as an inn-keeper, and the year he married he took over the tenancy of the Blacksmith's Arms, the pub run by his father-in-law at Thorney Down, in the parish of Handley, on the Salisbury to Blandford road. Gulliver changed the name of the pub to the (possibly ironic) King's Arms, and remained the tenant for ten years. Over this period, he seems to have prospered to an extent that could hardly be explained by the turnover of the small pub, and the farming of the little land around it. In 1777, he had enough money to lend £300 as a mortgage to a farmer near Shaftesbury. About seven o'clock the same evening a large body of smugglers came with pistols etc, on horseback, forced their way into the house, and carried the whole off in great triumph, shouting along the street, and firing their pistols into the air. While they were loading, they gave two casks of liquor to the mob to amuse them. From Thorney Down, Gulliver moved to Longham, close to Kinson, and bought the White Hart Inn. Bournemouth now occupies the shore-line to the south of Kinson, but when Gulliver lived there in the late 1770s, the area was desolate. 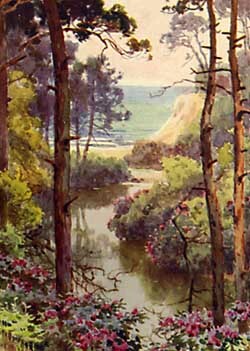 He landed goods all along the coast, but favoured Branksome Chine in particular, moving goods inland along a track that passed through Pug's Hole in Talbot Woods. Gulliver may have used Kinson church for the storage of contraband — certainly the tower was used by other smugglers for that purpose. When Gulliver sold the White Hart to move into Kinson itself, he significantly also auctioned off 'Twenty Good Hack Horses' — hardly a necessity for a publican. With the proceeds, he set up a regular alcohol emporium — a wine merchants, a malt-house and wine-cellars. From this base he traded quite legally for three years. In 1782 the government offered a pardon to smugglers who would join the navy, or who could find substitutes to perform military service on their behalf. For a man of Gulliver's means, buying a substitute was no problem (the going rate was £15), and he thus wiped the slate clean as far as his smuggling record was concerned. At this point Gulliver expanded his business interests, setting up another wine and spirits business in Teignmouth, and, it appears, simultaneously expanding his smuggling operations. He bought Eggardon Hill near Dorchester as a sea-marker for his ships, and planted trees on the summit to make the spot more prominent. but a few years ago the said Gulliver was considered one of the greatest and notorious smugglers in the West of England and particularly in the spirits and tea trades but in the year 1782... [he] dropped that branch of smuggling and after that year confined himself chiefly to the wine trade, having vaults situated in remote places and we are well informed that he constantly offers old wines considerable (sic) under the fair dealer's price from which circumstances there is no doubt that he illicitly imported that article. The report went on to add that Gulliver had retired from smuggling, but there is a possibility that the author was in collusion with the subject of his letter: the Poole official who dealt with this sort of correspondence was soon after sacked for passing information to smugglers. The reference to vaults in the report has fuelled speculation that Gulliver built a network of tunnels. One was supposed to run from Kinson to Poole, though this stretches the credulity to the limits. In 'retirement', Gulliver seems to have constantly bought and sold property, frequently moving round the Kinson district. He had a farm at West Moors that can still be seen, owned land at Handley, and at one time lived in Long Crichel, close to Thorney Down. Towards the end of his life he moved to Wimborne. His crowning achievement took place on the beach where the pier is now situated, when three large luggers, manned by determined crews and deeply laden with silks, tobacco and other valuables successively ran their respective cargoes; and it is in the recollection of an old inhabitant of the place, that the cortege conveying the smuggled goods inland extended two miles in length, at the head of which rode the old chief mounted on a spirited charger...Thus ended Old Gulliver's smuggling career; he 'coiled up his ropes' and anchored on shore in the enjoyment of a large fortune. Though the legends that have sprung up around Gulliver have doubtless been exaggerated, they are too persistent to ignore: one tells how, when his house at Kinson was searched, he dusted his face with chalk and lay in a coffin feigning death. Another story tells that the pardon he received was in gratitude for saving the King's (George III) life, by revealing an assassination plot; yet another that Gulliver was pardoned for passing on to Nelson intelligence regarding the French fleet. Poole lies 5m W of Bournemouth at SZ0090 The custom house on the quayside is a replica of the custom house broken open by the Hawkhurst gang and their confederates in 1747 (map 195). There'd be a pool for the devil, and fish for his dish. If the incident that took place in Poole in 1747 was anything to go by, the smugglers of the town amply deserved this reputation: in that year a substantial gang broke open the custom house on the town quay, and recovered a considerable cargo of tea that had been impounded there. They later went on to torture and murder an informer and an innocent customs man in the most horrible manner. However, to be fair to the home-grown smugglers, these grisly acts were perpetrated by men from Kent: the Hawkhurst gang. Poole's enormous harbour would seem to present the local smugglers with a considerable advantage, but it's hard to tell to what extent they made use of the many miles of creeks, saltings and inlets. Certainly in the 17th century, the most cost-effective way of smuggling goods into the town was by bribing the corrupt officials on the town quay. A less brazen way to go about the process was to unload the contraband into 'dragger' boats: boats with a shallow draught designed for use on the oyster beds. 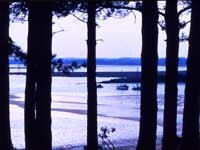 The draggers then took the contraband to stores on Brownsea Island, and from there to Poole and the hinterland. This approach was made impractical by the stationing of a crew of preventives on Brownsea. Poole smugglers made good use of the town drains, dragging contraband from the quay directly into the cellars of the town pubs. When there was a good flow of water through the pipes, after a rain-storm, the task was made considerably easier, because the smugglers could stand high up in the town, and let the water wash a rope down the channel to their colleagues at the quay. Contraband was then tied on, and the rope hauled up against the flow of water. It's said that when the customs men got wise to this trick, they waited at the harbour end for the rope, tied on a tub chalked with the legend 'The end is nigh', then gave a tug to signal that the load was ready. The tub was hauled into a cellar of one of the town pubs, and the smugglers read the appropriate message, at the very instant their adversaries burst in upstairs. In the late 17th century an investigation into the operation of the Poole customs house revealed many abuses, but it also pinpointed the key operators in the area. The most prominent smuggler was John Carter. His usual technique was to arrange for his ships to hover a little way off-shore, where they could be unloaded by the dragger boats. Once on land, Carter had countless stores and hiding places, and as a legitimate merchant, he also ran a variety of covers for his illegal operations: he had a windmill, a malthouse and a brewery, a shop, various stables, cellars, barley lofts, woodyards — all were used for hiding contraband. When Carter's men travelled through Poole, they wore masks and tall women's hats, such an effective disguise that they were unrecognizable. The substantial clubs they carried also induced rapid memory loss in those on the receiving end. Warner, Rev Richard, Literary Reflections, quoted by Short.